Tackle your toughest home, outdoor and auto cleaning projects with ease with the Sun Joe SPX4000 Electric Pressure Washer. Packed with 1800W of pure power, the 14.5 Amp motor generates up to 2030 PSI to demolish every last bit of dirt, grease, gunk and grime. Five Quick-Connect tips allow you to go from intense jet to gentle spray to suit the cleaning task and the onboard 1.6 L detergent tank lets you dial-in just the right amount of detergent to give your cleaning blast a boost. Featuring Sun Joe's exclusive Pressure-Select Technology, the SPX4000 lets you pick the perfect pressure to combat dirt and grime with professional results and a Total Stop power-saving system designed to save energy and prolong pump life when the trigger is not engaged. Cut your outdoor cleaning chores down to size and Go With Joe - the SPX4000 Electric Pressure Washer from Sun Joe. Get Equipped. 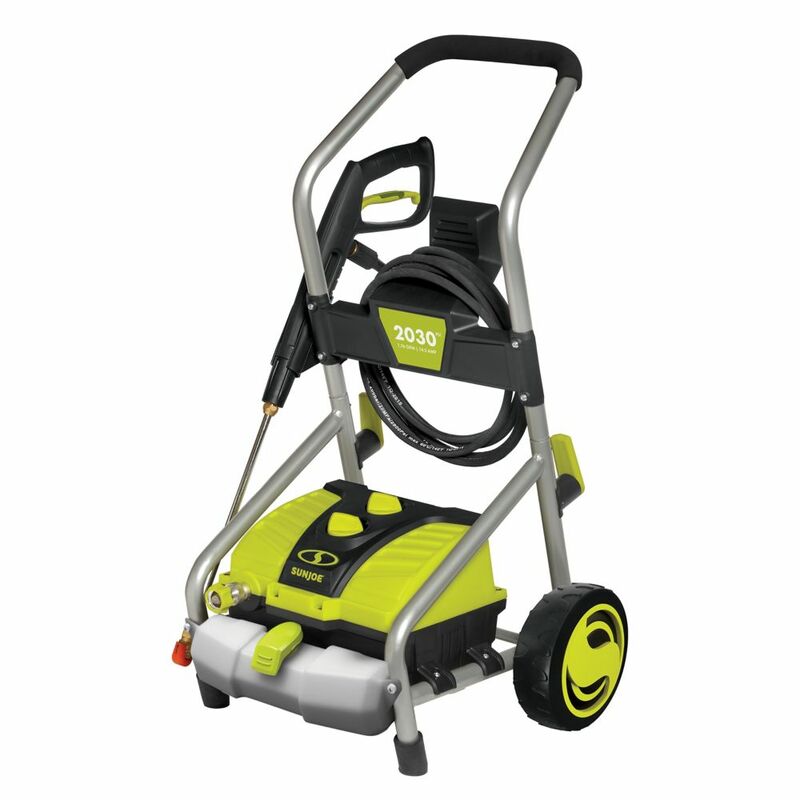 2030 PSI 1.76 GPM 14.5 Amp Electric Pressure Washer with Pressure-Select Technology Tackle your toughest home, outdoor and auto cleaning projects with ease with the Sun Joe SPX4000 Electric Pressure Washer. Packed with 1800W of pure power, the 14.5 Amp motor generates up to 2030 PSI to demolish every last bit of dirt, grease, gunk and grime. Five Quick-Connect tips allow you to go from intense jet to gentle spray to suit the cleaning task and the onboard 1.6 L detergent tank lets you dial-in just the right amount of detergent to give your cleaning blast a boost. Featuring Sun Joe's exclusive Pressure-Select Technology, the SPX4000 lets you pick the perfect pressure to combat dirt and grime with professional results and a Total Stop power-saving system designed to save energy and prolong pump life when the trigger is not engaged. Cut your outdoor cleaning chores down to size and Go With Joe - the SPX4000 Electric Pressure Washer from Sun Joe. Get Equipped. 2030 PSI 1.76 GPM 14.5 Amp Electric Pressure Washer with Pressure-Select Technology is rated 4.6 out of 5 by 319. Rated 5 out of 5 by Louis from Works great. ... Works great. Rated 5 out of 5 by Susan from I am completely satisfied with this pressure washer. I... I am completely satisfied with this pressure washer. I bought it to clean decking ( composite ), siding and cement, all of which it did beautifully! I also ordered the heavy duty extension hose and I’m glad I did, as I needed it to reach certain areas. Rated 5 out of 5 by The boy from Excellent product We purchased a Snow Joe a couple of years ago and it has worked wonderfully. Cleaning and resealing the decks is ur spring project. After reviewing the many suggestions the internet has to offer for deck cleaning we decided we needed a power washer. We did not want a gas powered one, and with the performance of the Snow Joe we looked to see if the company offered a power washer, it does, and we ordered it. It took about ten minutes to assemble, all connections were hand tightened only. Hooked up the water and Joe went to town on the decks. My wife did the power washing and could not believe how easy it was. Sun Joe performed great! Rated 5 out of 5 by HankP from Impressive!!! Works flawlessly as long as you supply it with enough water volume. One hose bib on the far side of my house did not supply enough water to use it on high. Everywhere else it works great. Rated 5 out of 5 by Mike Rhodes from Outstanding product that performs well! This thing is awesome. Works well in both modes, easy to use, lightweight, portable, and everything else you need in a home pressure washer. Also, their customer support is amazing! Rated 5 out of 5 by Danno from Goop pressure washer This is a great little pressure washer. I have washed both cars and the vinyl siding on the house. The vinyl siding looks like new. Rated 4 out of 5 by Ben1 from Easy as ever Bought this electric pressure washer knowing that the pressure would not be as strong as a gas operated model but it would be easier on maintenance. Was able to use this pressure washer several times now. Would have liked more pressure but at this price point it is sufficient. Great job cleaning cars and a wonderful job cleaning the deck! What is the difference between the Sun Joe power washers. SPX 4000 &amp; SPX4001 besides price. The reel is the only difference.